The week beginning 11 December 2004, on the farm in Diggers Valley. We brought the sheep in again because I sold three yesterday to a man who just wanted that many lambs. This morning he turned up with a lovely trailer with a cage on it and took them away. I decided he could have one half of three twin-sets, so that the ewes will continue to feed their remaining lamb and would not be quite as bereft as they would be in losing both of their babies at once. We wouldn't normally wean them quite this early, but they're certainly big enough - possibly even big enough to have gone off to the works, but I suspect we'd only have made as much for each as I've managed to sell them for, so I'm quite happy. Later we went out to visit our neighbour at the very back of the farm, who owns the land which includes Puketutu, the hill behind our place. She particularly wanted to get her water supply working, so we went up into the bush with her to investigate why it wasn't operating as it had previously done. What a "walk"! We were in there for about three hours and some of it was particularly steep and treacherous. Every now and again, from very steep parts, we could see through the canopy of the trees down to our farm, so we felt like we weren't very far from home anyway. We got the water going and then Stephan drove the 22km home around the road, while I walked home through the back of the farm, checking on cows and calves as I went. I brought the mob of 19 cows and calves in to the yards and quietly weighed all the calves, marking each of them with a symbol with my roll-on deodorant bottle of watered-down paint. Then I watched as the calves and cows paired up again and made a note of which ones belonged together. Next I brought in the ten older calves and their mothers and repeated the process. Then I enlisted Stephan's help and we drafted the calves off separately and tagged ears, vaccinated each with the 5-in-1 vaccine (protects against Pulpy Kidney, Tetanus, Blackleg, Black Disease and Malignant Oedema), and castrated the bull calves which are sons of the commercial cows. It's always a nervous moment, putting the calves back with their mothers and making sure I really did get the right numbers in the right ears and didn't accidentally put a rubber ring around a potentially valuable scrotum! Once all 29 calves were done, I asked Jane to come and be a road warning person, since we've been having rather too many idiot drivers on the road lately. While Jane kept watch near the worst corner, Stephan and I first herded the 10 cows and calves across into the hill paddock, then the group of 19 cows and calves. They've not been together as one mob since before calving, so I didn't want them to be trying to sort out their social order until they were safely all in the paddock. Once there they settled down quite happily anyway, since they'd been in the yards for a few hours and wanted to eat rather than fight. Then Stephan and I went for a walk up the road to check the young cattle in the Road Flat paddock. 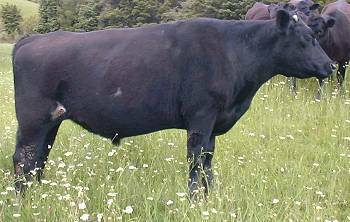 I really like heifer 443, at right; I think she's going to make a great cow. 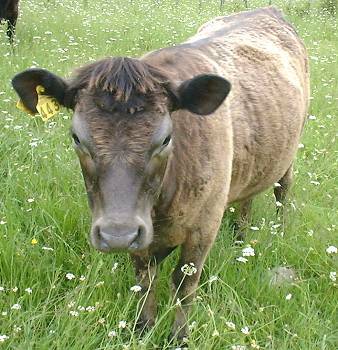 She has a habit of cheekily bouncing around behind me when I walk through any paddock she's in! Below is steer 356 who still sports the injury on his side. It is gradually healing, but is taking such a long time. I may have to look at doing something more to help it along a bit again. We're due to go away for a couple of days on Wednesday, so Stephan got Damian in and shore him. Damian has had a number of fly companions hanging around lately, so although there was no fly-strike on him, it seemed sensible to get his wool off. He must have been getting rather warm on some of the finer days lately! 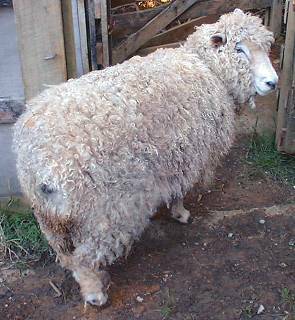 Every time he's shorn, the job gets harder because his lumpy skin disorder is getting progressively worse. I've spoken to the vets about it in the past and there wasn't anything we could realistically do about it. The lumps don't seem to bother him and he's healthy enough for an eight-year-old wether and we've even managed to stop him from becoming obese, which is often a problem with such sheep. His mother had the same sort of lumps and I didn't keep any of Damian's siblings because of the risk of the problem continuing in his family. These sheep are getting quite used to being mustered at the moment! Today it was into the cattle race to weigh them all in preparation for drenching all the lambs and the ewes which are going to Auckland. Usually we put the weighing platform into the sheep yards, but since I'd just set up the cattle race again, it was easier to bring them over here. 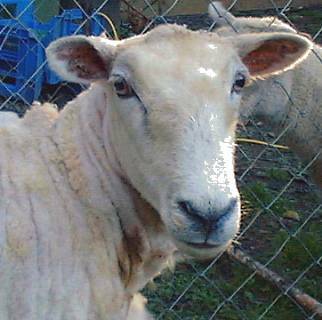 The shorn ones are those going to Auckland and the others, for the moment, are staying here. 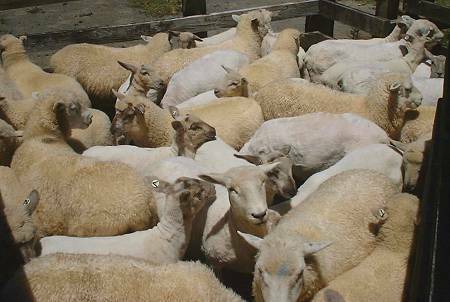 After Stephan completed the drenching, I vaccinated the Auckland lambs, so their new owners will only have to do them once again in four to six weeks and then annually just before lambing, should they breed them. What a stinkingly nasty day! It rained and blew and was thoroughly unsatisfactory for preparing to go away on a trip with 18 sheep on the back of the ute! I spent a couple of hours attaching wind-break cloth and recycled feed-sacks to the ute-cage, to provide some protection from the wind and rain for the sheep. The air temperature was quite warm, but wet sheep will get quite cold in a strong wind, to which they would be exposed for the five hours we estimated our journey would take. We finally got away from home about two hours later than I'd planned (like that wasn't predictable?) and drove gingerly along the road. The sheep, once they'd settled themselves to the movement, travelled surprisingly well, and I was able to maintain some very satisfactory and comfortable speeds for much of the journey. The lot of them weighed nearly ¾ tonne and being up off the deck by the length of their legs, could have been a difficult load with which to drive! We stopped from time to time to check that all were well, but there was so much shuffling around after each stop that once we knew they were alright, we just kept going. They got a bit cold half-way through the journey after some very heavy rain and I was extremely glad I'd gone to the trouble I had, to protect them from the wind and rain! 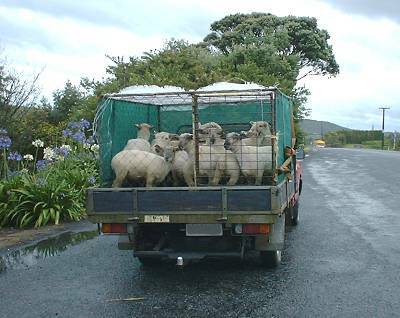 We were photographed by someone in a following vehicle, who then didn't even respond to my cheery wave, as we passed through Kaiwaka - perhaps they were Animal Rights friends and we'll find ourselves pictured somewhere else on the internet as evil animal abusers for trafficking live sheep! We arrived at our destination just after dark and the sheep jumped off the back of the ute and the lambs had their first feed for several hours! Sue, who had bought the sheep, very kindly fed us before we went on into Auckland to stay with Jude (my sister), Roger, Stella and Jasper. Stephan and I went off hunting for wood-working tools. We've had a very bad run with a company which sold us an unreliable brand of bandsaw and after replacing it once, we've finally convinced them to accept the second faulty one back and refund our money, but not without a great deal of messing around. We didn't want to spend the money again until we actually had it in the bank, but decided to go looking at a machine which could soon be purchased. We had a great time driving around in far too much traffic, but with Stephan navigating and me driving, enjoyed it just because it was so different from what we normally do. We went visiting on our way home, which then meant we emerged into rush-hour traffic, so trickled along the motorway back to the middle of Auckland at some ridiculously slow speed. Being tricky clever people, we got off at Greenlane and while I was sitting waiting in a huge queue of traffic, Stephan bravely leapt out and walked to the supermarket to buy the makings of one of his fabulous pizzas for dinner for everyone at Jude's place. By the time we'd finished doing that, the traffic had thinned a little and we carried on home to feed the hungry hoard. I guess we all get used to the ways of our usual lives, but I'm glad I don't have to make that sort of journey on a daily basis! We headed out to Waimauku, north-west of Auckland, again to see the sheep in daylight and make sure they were all well after their long wet journey. Other than Minty being a little lame and the ewes a bit empty-looking, they seemed fine. I should imagine it would take a few days to recover from such a trip and then to adjust to a slightly different diet. Their new home is entirely deer-fenced, so I think Minty will realise she can't go just wherever she likes! A jolly good thing too. Then we headed up to Kaukapakapa to meet a woman I've met via the internet, and her lovely daughter. They showed us their gorgeous sheep and then led us 'down the garden path' and into a patch of regenerating bush, full of Tanekaha (Celery Pine - Phyllocladus trichomanoides) and some very impressive Kauri! There are apparently some deer in the area, so I figured it would be acceptable to rescue a few very tiny Kauri seedlings and take them home. We weren't quite dressed for bush-bashing and didn't have as much time as we would have liked to be able to spend there, so we're looking forward to another visit some time! Thank you, Pip and Alex!